Reaching out and establishing ties to the community are important elements of the redevelopment of St Cecilia’s Hall. But how does a museum work with the community when the building is closed? By creating partnerships and taking our collections out into the community. Recently MIMEd partnered with the Scottish Chamber Orchestra to provide quality performances and programming to audiences of all ages. 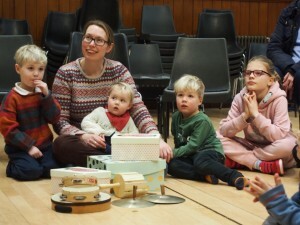 SCO Connect, the creative learning team of the orchestra, worked with MIMEd Learning & Engagement Curator, Sarah Deters, to organise two Family Workshops which combined storytelling, live musical performance, and museum ‘show and tell’ for children aged 4-10 and their parents or care givers. The participants heard excerpts from The Crocodiamond, the story of Rita, a young girl who foils the theft of the largest diamond in the world. Providing the soundtrack for our storyteller were two musicians from the SCO playing violin, horn, and assorted percussion instruments. Before and after the workshops participants had the opportunity to learn about, hear, and play items from the collections of MIMEd. 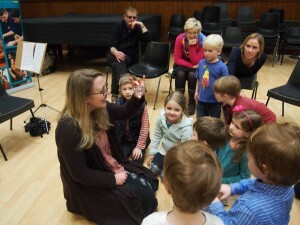 Visitors young and old explored the sounds of serpents, horns, and even a Picco pipe (the smallest form of a duct flute). The workshops were a great way to combine fun, learning, performance and MIMEd looks forward to future collaborations with the SCO and their creative learning team.